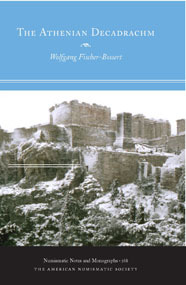 The first monograph in over 35 years in any language to study the coinage of classical Athens. It collects for the first time the evidence for the largest denomination ever produced by the Athenian state, the ten-drachma piece, and situates the coinage within its social, political and economic background. This book represents a huge advance on the previous study of the material, Chester Starr’s Athenian coinage, 480–449 B.C. (Oxford, 1970). Fischer-Bossert has collected more than three times as many specimens as were known to Starr, and has provided a full account of the known forgeries drawn from the photo-files of major dealers, scholars and museums. A die-study of forty genuine Athenian decadrachms in public and private collections is provided, together with a catalogue of more than ninety modern forgeries. Almost all are illustrated. This will be an indispensable work for all interested in the coinage and history of 5th-century Athens. In addition, its judicious discussion of the history of the forgery of these remarkable coins will make this volume a handbook for all serious collectors of ancient Greek coinage.